The earlier computers from DEC (Digital Equipment Corportation), such as the KA model of the PDP-10, in common with the other computers of its day, included many so-called 'indicator panels', containing arrays of lights which provided information about the internal state of the machine. Not only the CPU had such lights; other devices, such as disk controllers, also had their own indicator panels. This tradition lasted through the early PDP-8 and PDP-11 models, although the PDP-11 CPU light displays were modest compared to earlier CPUs. The earliest PDP-11 disk controllers were very much a match for the earlier machines, though, and included indicator panels which displayed a great deal of information. Alas, the cost of such displays was high, and they were dropped from later controllers. Their passing was mourned by those who had had the opportunity to work with them, though; in addition to helping with debugging (both hardware and software issues), and giving an extensive insight into how the machine was operating, they were also just a lot of fun. Today, 'das blinkenlitz' (as the are often referred to now) are a focus of the computer heritage movement. This page documents many of the DEC indicator panels, so that when one is seen, it can be determined what kind of indicator panel it was (the 'inlay' which had the captions for the meaning of the individual lights on it usually did not say what kind of device it was for). PDP-10 memory which used a 19 inch rack (most of the KA-10 memory and devices were in wider ?? inch racks) used a standard indicator panel, with only the inlay being customized to the particular device; the panel provided 4 rows of 36 lights each (although not all were used; unused lights were simply not wired up). The PDP-8 and PDP-11, although not 36-bit machines, also used the same indicator panel, but in general did not include any 36-bit fields. (The exception is the RP11-C, which was able to read packs written on a PDP-10, and thus included a 36-bit shift register, which was displayed on the RP11-C panel.) The 18-bit PDP-15 also used (extensively!) this indicator panel. Limited engineering drawings (they do not include the full mechanical drawings) for this indicator panel are included in the RF11 Engineering Drawings set; the indicator panel is shown on pp. 186-190. Of particular interest are the parts lists, which include all the inlays extant as of the date of the drawings (10/1972). along with a number of others, the use of which is not currently known. The tables below list the indicator panels available for each machine type, and include links to larger images of the panel (where we have images - anyone who has an image of one of the missing panel is urged to provide it), and (for some), detailed information about the panels. RK08 Like the TC08, only two rows of lights, out of the four available, were used. DX11 The DX11 is an IBM 360/370 Channel interface. RF11 RF11 details Easily recognized in low-resolution images with the two groups of three single lights on the left-hand side. For those who are finding the captions hard to read in this image, a drawing is available here. RP11 RP11 details Two variants are known for this, known as "RP11" and "RP11-C" in the DEC documentation; they differ only in that one contains two lights (ORDY and IRDY, on the right hand of the second row down) which are not in the other. 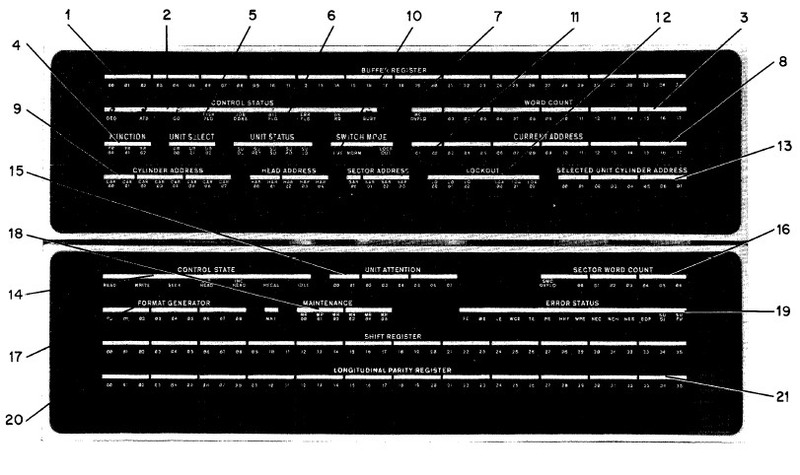 RK11-'B' Images of this panel appear in DEC promotional literature for the PDP-11, but as far as is known DEC never shipping this panel as a product. Extensive coverage of what appears to be a pre-production (hence the notional 'B' naming) version of the RK11 which used this panel is available here. RK11-C RK11-C details The RK11-C engineering drawings show that it was wired to connect up to an indicator panel, but as far as is known, none were ever actually produced. None of the extant RK11-C documentation mentions such a panel, and the indicator panel engineering drawings do not list an RK11-C inlay. 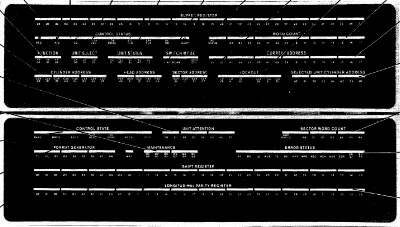 This panel does not go with a specific device, but includes information from a number of CPU-related systems; the lower rigft quadrant is mostly the KT15 memory management, the upper left is the KA15 priority interrupt system, but there is general CPU/system information throughout (memory parity, power fail, instruction register); the top right line seems to be the paper tape reader input buffer. FP15 As the drawing of the indicator panel connector (pg. 73 of the prints) shows, this panel is full. RF15 Identical to the RF09 indicator panel. RP15 The RP15 had two indicator panels. The inlays themselves were constructed with a silk-screen process. DEC started with a clear blank, smooth on both sides. To the back they applied first a black layer, with the 'holes' in it for the lights to show through; on top of this they applied a 'diffusion' layer of frosted clear coat. (These may be seen here, on a scan of the back of an inlay.) The front contains the captions, and then a similar diffusion layer over the entire inlay. The inlay itself is 4-23/32" high, and 18-9/16" wide. (All measurements are given in imperial units, since that's what they would have been specified in at the time the originals were made - and they come out exact, below, if given in those units.) The corners - shown here in another scan - are 3/8" radius (as measured with a corner gauge). The distance from the top of the holes in the top row to the bottom of those in the bottom row is 2-7/8"; from the left of the left-most hole to the right of the right-most is 15-9/16". So, the inter-row distance (hole center to center) is 2-5/8 / 3 = 7/8" (exactly); the inter-column distance (again, center-center) is 15-5/16 / 35 = 7/16" (again, exactly). Individual holes are each 1/4" wide. That makes the distance from the left edge of one hole, to the right edge of the next, 3/16"; and similarly, from the bottom of one, to the top of the next, is 5/8". Thanks to Al Kossow, of the Computer History Museum, for the images of the RF11 and RK11-'B' panels.